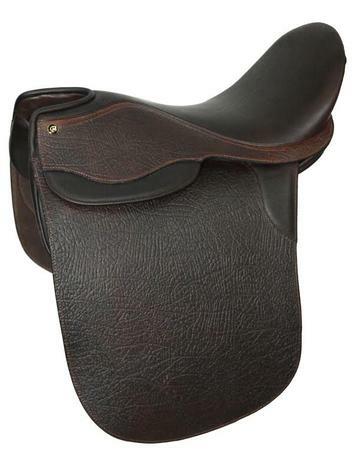 This quality built show saddle is constructed on a sturdy hand made resin reinforced wooden tree. We use the highest quality buffalo hides available in the world in the construction of the durable, extra wide flaps providing a nice grip and a lasting attractive finish. The deep seat is finished in smooth calfskin with a nice texture. The Perfection Ulitmate Pro has contoured cushioned panels that provide a close contact to the horse while providing protection to the horse's back. The billets are constructed using heavy duty chrome tanned strap leather for years of wear. This saddle also includes removeable knee rolls for security when you need it. They are easily attached and detached by velcro adhesion. The Ulimate Pro has the proprietary adjustable bar system used on all Perfection and Shively saddles for the perfect leg position. During field testing one Arabian trainer stated "This is the very best Cut-Back Saddle I have ever used!" Comes with a free nameplate and a fitted cover. Available in rich Havana Brown or Black in sizes 21" or 22". 19" and 20" are available by special order. We are excited to present this new model for your consideration. The saddle tree and stirrup bars have a 5 year guarantee against breakage under normal wear and tear and the entire saddle has a 2 year guarantee on it's workmanship.